The total value of all publicly traded cryptocurrencies has declined more than $10bn in the last 24 hours, amid a sell-off that broadly impacted the nascent asset class. 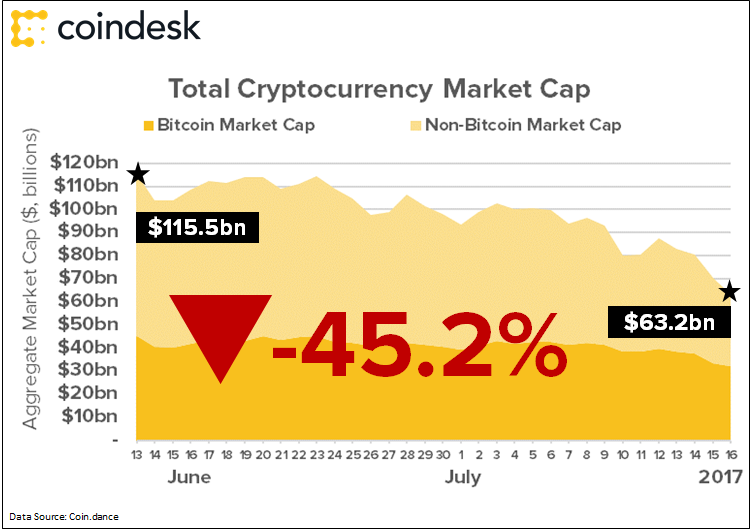 With the move, the market has now declined precipitously from a peak reached in mid-June, when it set an all-time high of $115bn, according to data from Coinmarketcap. In just over 30 days, the market has fallen 46.9%, falling to a low of $61bn at press time. 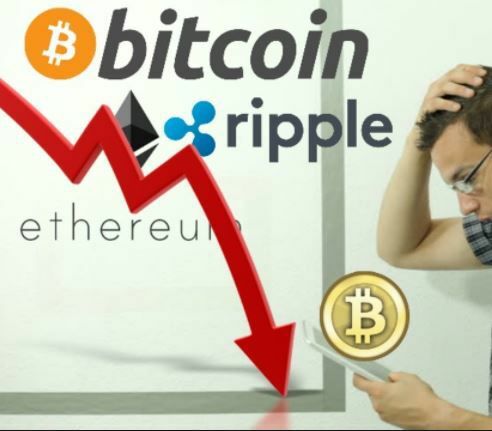 Among the most affected in today's decline were cryptocurrencies that had seen wild gains in recent months, including ether, and XRP, the cryptocurrencies that power the ethereum blockchain and Ripple Consensus Ledger, which were down 28% and 25%, respectively, over the last 24 hours. Also affected was the price of bitcoin, which continued to decline today after dropping below the $2,000 mark yesterday. Overall, it hit its lowest value since mid-May during the session. Like the broader market, the value of tokens on the distributed payment system were down roughly 38% from an all-time high set in June. In just over 30 days, the price of bitcoin has fallen 38% from $3,018 on 12th June to a press time low of $1,866 today. The figure was the lowest total observed on the CoinDesk Bitcoin Price Index (BPI) in 58 days, or nearly two months of trading. Notably, both developments come amid what could continue to be a trying time for the cryptocurrency asset class after euphoric gains in the first half of Q1. In the coming weeks, technical developments in bitcoin as well as changes to ethereum's emerging ICO economy, could continue to put sell-side pressure on the market. At press time, just three top 50 cryptocurrencies showed any signs of bucking the trend, with little-known assets including chaincoin, mooncoin and SIBcoin posting larger gains.